Cardiomyopathy is the condition where the heart muscle does not work properly. Heart failure is the condition in which the heart does not pump properly or effectively. The symptoms include being short of breath, having pain in the chest and fainting during exercising. Palpitations of the heart may also be present. In restrictive cardiomyopathy, people may have difficulty breathing when exercising and at night and fatigue. The condition can result in heart arrhythmias and angina. Diagnosis can be made by an MRI, chest X-ray, ECG, and echocardiography. The echocardiography and heart wall biopsy is particularly useful for determining which type of cardiomyopathy a person has. The cause of cardiomyopathy that is hypertrophic appears to be genetic, with several mutations having been discovered. 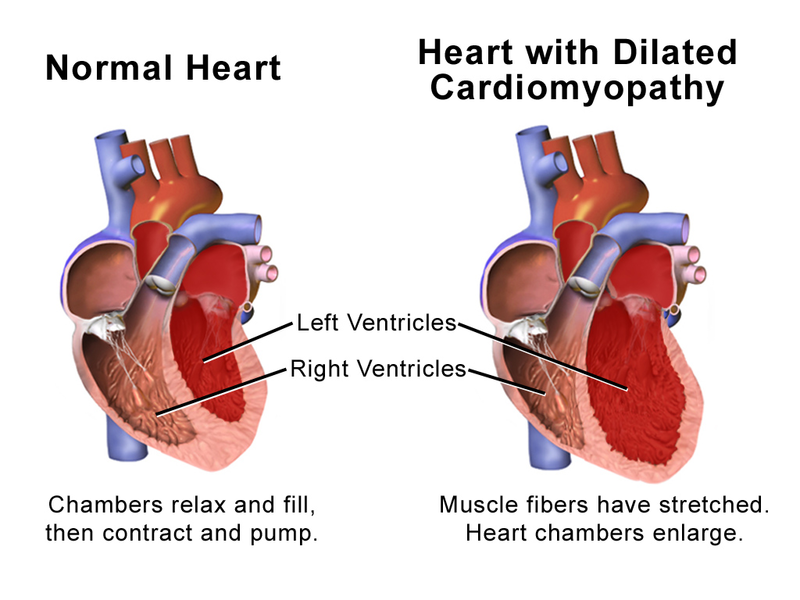 Dilated cardiomyopathy is caused by the heart beating too fast over a period of time. This is usually due to viral infections, Trypanosoma cruzi parasitic infection and exposure to toxins. About 1/5 of cases do involve genetics. The causes of restrictive cardiomyopathy are speculated to be certain underlying disorders and probably genetic problems. The risk factors for hypertrophic cardiomyopathy are having a family history and having certain genetic mutations. Risk factors for the development of dilated cardiomyopathy are really exposure to viral pathogens, having Chaga’s disease (which is caused by T. cruzi) and having a viral infection. In the case of hypertrophic cardiomyopathy, the usual treatment is medication such as calcium channel blocking medicine and beta blockers. In cases of dilated cardiomyopathy patients may also need to be given diuretics and digoxin and may need to have a cardioverter-defibrillator implanted. Patients with restrictive cardiomyopathy also often are given medicines such as diuretics, beta blockers, and digoxin. Heart failure is the condition when a person’s heart is not able to pump properly or effectively. This can have several consequences including the retention of a large amount of fluid in the body if it is congestive heart failure. The symptoms may be different according to which lower chamber of the heart is being impacted. Right ventricular failure usually is made evident by symptoms like exhaustion and swollen ankles along with other signs like a swollen abdomen. Left ventricular failure is evident when a person has trouble breathing and shows a drop in cardiac output, which is even more obvious during exertion. Heart failure is diagnosed by a physical exam along with the administration of a chest X-ray, ECG, and cardiac scan. Blood tests to look for concentrations of certain natriuretic peptides are also done and can show how bad the problem is. Several disorders cause heart failure including cardiomyopathy, hypertension, a myocardial infarction (heart attack), coronary artery disorders, valve disease, and diabetes. Risk factors include having cardiomyopathy, particularly dilated cardiomyopathy; having uncontrolled diabetes, high blood pressure, a family history of heart problems and heart valve or coronary artery problems. 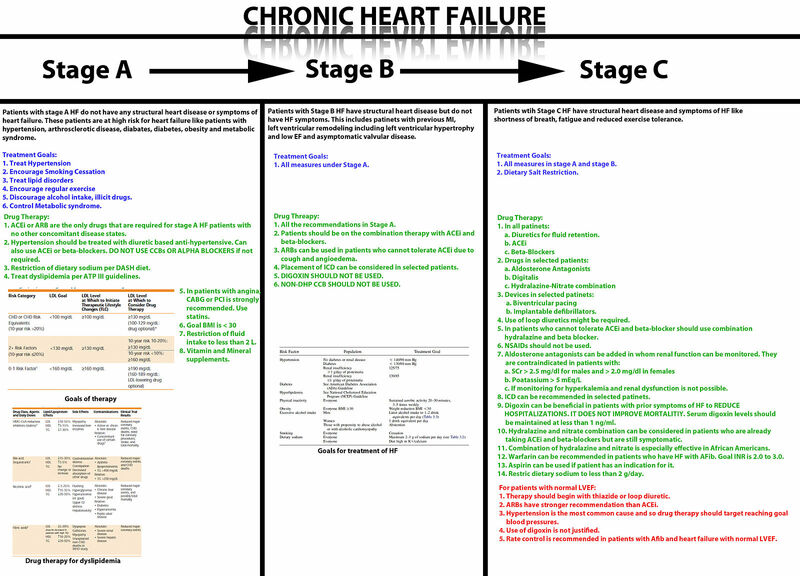 The way to treat heart failure is to establish what caused it in the first place. Depending on how severe the problem is an individual may require a heart transplant. In the early stages of heart failure medication such as beta blockers, calcium channel blockers and ace inhibitors may be helpful. A cardioverter-defibrillator may need to be surgically implanted if there are problems with the heart beating too fast and with the heart beating irregularly (tachycardia and fibrillation). Cardiomyopathy is a problem in the heart muscle. Heart failure is the problem when the heart beats ineffectively. Cardiomyopathy is often congenital, and is therefore quite common in children. Heart failure is not a common condition found in children. The mortality rate for cardiomyopathy is usually 1% to 10% per year. The mortality rate for heart failure is from 10% to 40% per year. In cardiomyopathy patients often are short of breath or have trouble breathing when exercising. Depending on the type of cardiomyopathy they may also have palpitations and trouble breathing at night. Sometimes people may faint while exercising. Heart failure can cause symptoms such as swollen ankles, fatigue, trouble breathing, lower cardiac output, palpitations and a feeling of faintness, which is not limited to exercise. ECG, chest X-ray, MRI, echocardiography and muscle wall biopsy can diagnose cardiomyopathy. Cardiac radionucleotide scans, chest X-rays, along with ECG and tests of levels of a natriuretic peptide can diagnose heart failure. The main cause of cardiomyopathy is genetics and viral infections. There are many causes of heart failure including having had a myocardial infarction, having hypertension, heart valve problems, cardiomyopathy, coronary artery disease and diabetes. Cardiomyopathy risk factors include having a family history of the condition and having a viral infection. Heart failure risk factors include a history of heart problems, including cardiomyopathy, having a family history of cardiac issues and having diabetes. There are no renal (kidney) complications with cardiomyopathy. There are often renal complications with heart failure. Cardiomyopathy can be treated with medications such as beta blockers, digoxin, and calcium channel blockers. Heart failure can be treated with the same medications as cardiomyopathy but also nitrates and diuretics, and sometimes a cardioverter-defibrillator or a transplanted heart may be necessary for survival. Cardiomyopathy is when there is a problem with the heart muscle. Heart failure is when the pumping ability of the heart is seriously compromised. Cardiomyopathy can lead to heart failure in some cases, but more commonly, sudden death. Some of the same diagnostic tests and medications are used in the case of heart failure and cardiomyopathy. Dr. Rae Osborn. "Difference Between Cardiomyopathy and Heart Failure." DifferenceBetween.net. January 29, 2019 < http://www.differencebetween.net/science/health/difference-between-cardiomyopathy-and-heart-failure/ >. Soufer, Robert, et al. "Intact systolic left ventricular function in clinical congestive heart failure." American Journal of Cardiology 55.8 (1985): 1032-1036.